Your safari experience: In Paris, enjoy a luxury amenity on check in including a bottle of French Champagne served chilled with a box of chocolates and a bouquet of fresh roses. Next, a luxury safari at Singita – South Africa’s most exclusive private game reserve and luxury lodge, followed by a five-star beach experience at North Island in Seychelles – the most intimate private island on the Indian ocean. North Island offers unique exclusivity with large spacious beach accommodation, a vast range of recreational activities, including world-class scuba diving, and mouthwatering cuisine customized to your tastes and preferences. Experience the very best of travel - city, safari and beach - on this memorable vacation. On arrival in Paris, South Africa & Seychelles, experience a personalized VIP welcome and private transfer assistance by the dedicated Guided Safaris team. One of the world's most romantic cities, Paris is pure indulgence. Hôtel de Crillon is a moment of distinction offering the warm atmosphere of a private residence yet glittering with the glamour of having hosted legendary personalities, such as Coco Chanel and many a royal family. The boutique luxury hotel offers the French “art de vivre” in a fine historic building, with the refinement of eighteenth-century decor and fully personalized service; a luxury now accessible to all those who appreciate the value of such exceptional surrounds. Each room at Hôtel de Crillon has its own individual designer decor and color scheme. All feature a large King-size bed with fine linen. The bathrooms feature Carrara marble decor, twin sinks, with bathrobes, towels, and slippers embroidered with the hotel's crest. Annick Goutal perfumed toiletry products complete the bath amenities. The Crillon is in a class of its own: The main restaurant Les Ambassadeurs is one of the finest dining experiences in Paris. L'Obe is a delightful French experience offering a contemporary and relaxed atmosphere in a setting that fast become the leading venue in the fashion and art district for a convivial lunch or romantic dinner. The winelist at Crillon is a world-acclaimed affair - from easy wines-by-the-glass to exquisite vintages in ever-alluring magnums, there's sure to be a few to delight your palette. The star-studded, intimate bar scene at the Crillon is always a magical start to the perfect evening. With sumptuous cocktails, gourmet bar snacks and live piano music the atmosphere is set for a classy Parisian night in town. Just a step away from the beautiful Hôtel de Crillon, you'll discover the Champs Elysees, Louvre museum, Jardin de Tuileries, Grand Palais, all the extraordinary high-end luxury boutiques of rue du Faubourg Saint Honoré and Rue Royale, both standing as world-wide symbols of Haute Couture and Parisian chic, and the decadent Paris Theatres & Opera. This is the perfect location for art, culture and fashion enthusiasts. Enjoy IntoSeychelles Signature Concierge service at the Crillon to design an itinerary through the city, winelands and further afield, if you like. The 24/7 concierge at the Crillon offer an exceptional range of contacts to arrange your every whim. Whether its a concert, the theatre, a gallery opening or a last-minute table for two, Hôtel de Crillon ensures you experience the best Paris has to offer. On arrival in Mahe, Seychelles you will be welcomed by our on-ground crew. As the helicopter takes off, your visit in paradise elevates to seventh heaven - a short, incredibly scenic, flight away lies the exquisitely beautiful North Island; your home for the next few nights. Aimed at providing the very best in exclusivity and luxury, North Island is considered as one of the most beautiful & unique destinations on Earth. 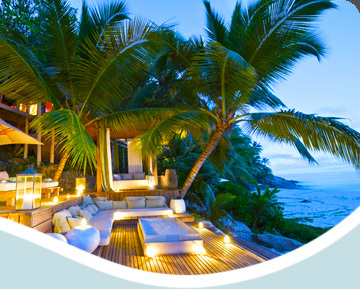 North Island Seychelles is a rare sanctuary for couples seeking a pristine tropical haven on a large private island in the vastness of the warm, blue Indian Ocean, surrounded by forest wilderness that echoes with the calls of the rarest birdlife in the world. Only 11 luxury beach villas on the entire island, each constructed to create a sensorial experience in surroundings of understated elegance, offer panoramic views and direct beach access right before the living areas. Your stay at North Island Seychelles is inclusive of all meals, house wines and beverages, along with a huge choice of complimentary activities such as scuba diving (two dives per day), guided walks / hiking, snorkeling, fishing, boating, kayaking and mountain biking. The North Island Spa, perched high above the beach with stunning views of the ocean, specializes in personalized holistic treatments to rejuvenate the body, mind and soul. Mouthwatering gourmet meals are accompanied by fine wine at both North Island and on safari Singita, all inclusive of your stay. Our guests receive a bottle of champagne to toast to a magical safari experience. North Island features a special 'no-menu' concept, whereby the chef meets with you on arrival to discuss your tastes and favorite dishes to customize a special menu, just for you throughout your stay, with special ingredients flown-in daily.